1. Jo Malone Wood Sage & Sea Salt: One of my favorite scents, Jo Malone's Wood Sage and Sea Salt Candle is subtle but luxe. It burns evenly and for up to 45 hours, and is light, a bit sweet, and a bit earthy. 2. Le Labo Palo Santo: Though I can't get enough of Le Labo's famous Santal (that's the scent you smell all over LA), their Palo Santo candle is a lovely, moody scent with cedarwood, incense, and patchouli. The intoxicating scent spreads really nicely. 3. Pour L'Air Nap Lovers: An ultra-cool minimalist candle brand, Pour L'Air makes their gender-neutral scents in LA! Their Nap Lovers candle is exactly as described; with black fig and roots, it instantly evokes taking breezy naps at a summer house. 4. 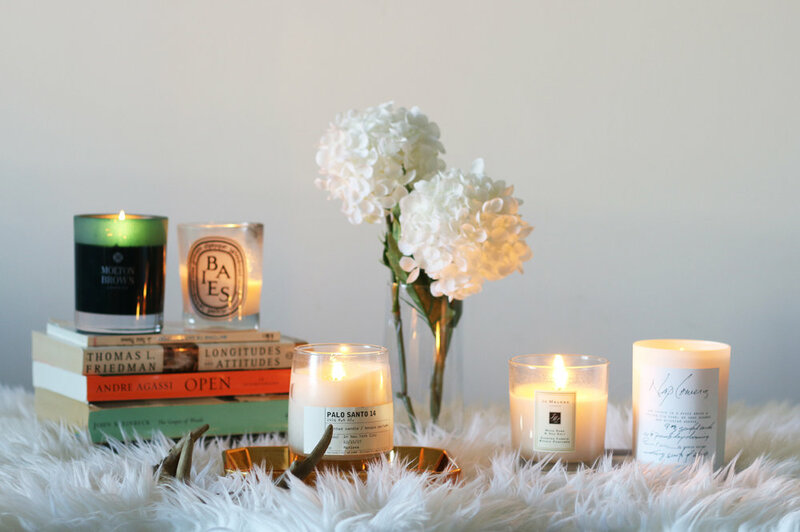 Diptyque Baies: It's hard to pick just one favorite from this iconic, Insta-worthy brand. But their Baies candle is one of the most famous; crowd-pleasing with roses and blackcurrant leaves, the scent is fresh and a bit fruity. 5. Molton Brown Russian Leather: From Molton's Brown new Fall collection, their Molton Brown candle is a nice change of pace. First, the deep teal color stands out amongst my minimalist collection, while the masculine scent smells like London and wanderlust.